Dr. Gillet grew up in Southern California and graduated with her Bachelor of Science in Animal Science/ Pre-vet from Cal Polytechnic Pomona and her Doctorate of Veterinary Medicine from St. Georges University in the Caribbean. She completed her clinical rotations at Louisiana State University. Her passion has always been to work with exotic animals. Before veterinary school she worked at multiple veterinary hospitals as a veterinary technician and the San Diego Zoo’s safari Park as a mammal keeper. Dr. Gillet also volunteered with multiple organizations that deal with wildlife and exotics such as Project Wildlife, Nurtured by Nature and Lions, Tigers and Bears. She is a director for a non-profit called Global Conservation Force that helps many endangered species such as rhinos, elephants, giraffes and pangolins. Aside from veterinary medicine, Dr. Gillet enjoys traveling, diving, rock climbing, photography, hiking and archery. 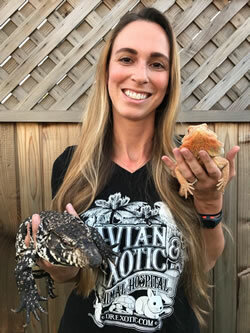 She also enjoys spending time with her many animals: dog (Koda), cat (Toulouse), geckos, bearded dragons, Argentine black and white tegu and poison arrow frogs.